When you submit something for publication–be it a novel or a short story–you’ll probably have to put it in Standard Manuscript Format. And while most folks are fine with 12pt Times New Roman and italics (which I strongly prefer), you occasionally find folks who really want the “Courier New + underlines instead of italics” variant. Today I submitted a story to a place that wanted just that. So what was I going to do? Reformat the entire story by hand? Thankfully, I just discovered that Word’s search and replace feature will do this for you. Here’s how! 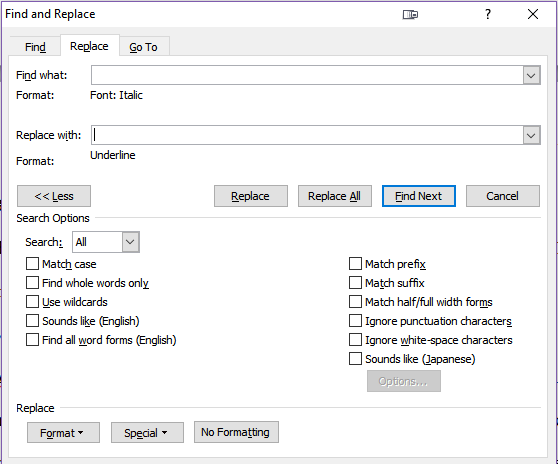 First, open Word’s Find and Replace tool (shortcut: Control+H). Now move your cursor to the “Replace With” box. 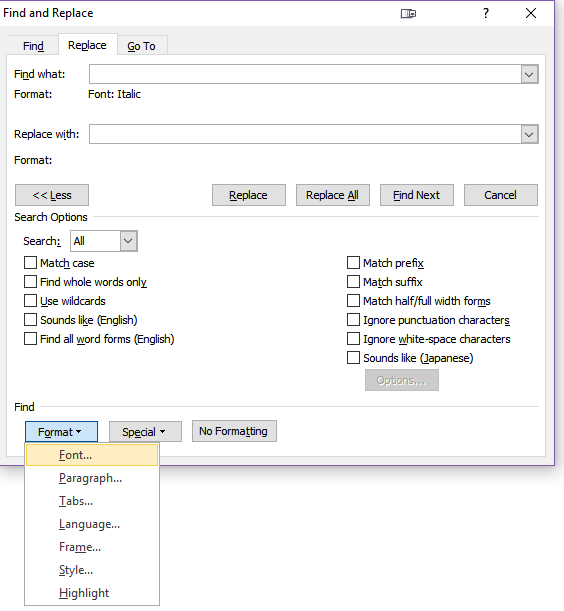 Under “Underline Style,” select one underline, with the thinnest line. This will make your italic font underlined, but it’ll still be italic. 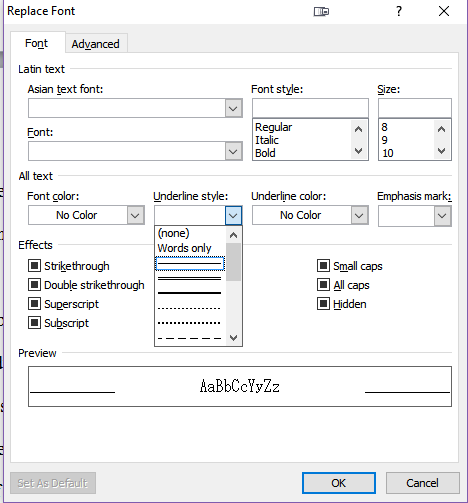 To remove the italics, select all of the text in the file (shortcut: Control+A). This will put your entire story in italics, then remove it all. Once you’re done, there’ll be no italic font left in your story–just the stuff you underlined before. You’ll probably want to do a quick scan through the file to clean it up. You can’t tell when the space after a word is italicized, for example, but you’ll definitely realize it when it’s underlined. Fix all of that. Converting all of Word’s curly quotation marks to straight quotation marks. …And much more. I’ve used Find and Replace for a lot of stuff over the years. And now that I know you can mass-replace formatting, it’s going to be a heck of a lot easier to submit to a variety of places–no matter how they want the story to look. Next ›Submission Terminology: Exclusive and simultaneous submissions. What do they mean?